The first round table discussions between banks and businesses on how to remove barriers to the supply of funds will take place at the University of Ulster today. Ronnie Patton from the University’s Ulster Business School is behind the new, ‘Business Banking Round Table’ initiative, which is being supported by the British Bankers’ Association at both a local and national level. Representative organisations for banks and businesses will attend the meeting - the first in a series - at the Jordanstown campus. Mr Patton, a senior lecturer in Accounting, said: “The object of the Round Table is to provide a forum where businesses and banks achieve a common appreciation of each other’s perspective in the current economic circumstances. “This initial meeting will provide the first opportunity for stakeholders to share ideas and acknowledge the positions of others and their proposals. “Once we have defined the common ground, the Round Table will then identify the gaps that exist and begin a dialogue to close them. “All of the organisations represented at the meeting are committed to developing initiatives for mutual benefit, including removing barriers to the supply of funds to credit-worthy businesses. Eric Leenders, Executive Director of the British Bankers’ Association (BBA) said: “We are delighted to be involved in this initiative, and welcome the contribution from the Ulster Business School in bringing all the relevant interests together for the benefit of the region. 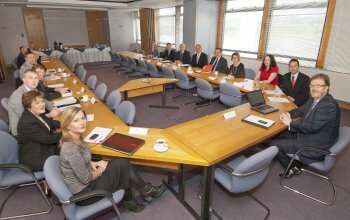 Caption: The first meeting of theBusiness Banking Round Table hosted by the University of Ulster.